During Reunion 2014, classmates of Madeleine Albright ’59 enjoyed a private tour and gallery talk of Read My Pins: The Madeline Albright Collection at the Davis Museum—and now others may hear the stories behind the collection in Pins and Diplomacy: A Conversation with Madeleine Albright ’59 and H. Kim Bottomly. Former Secretary of State Albright’s pin collection did not develop, initially, from an effort to “collect”; the assortment has grown organically over her life and career with the pins purchased as chance finds or presented as gifts from family, friends, colleagues, and world leaders. 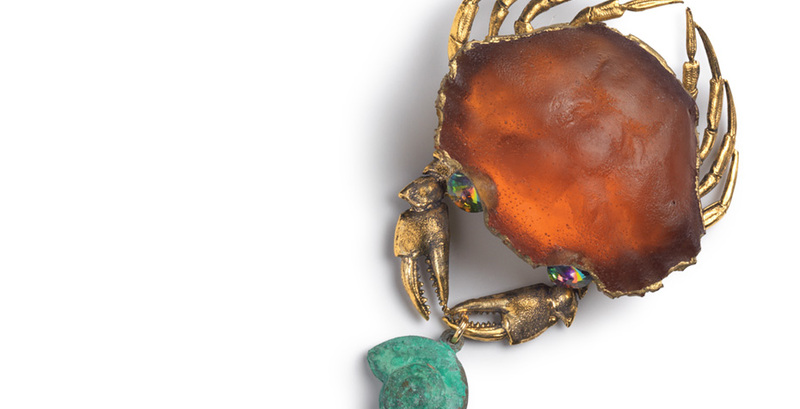 While the collection does include select antique and fine jewelry pieces of some monetary value, most are more notable for their political and personal significance. From the fraternity pin presented to her by her then-boyfriend during her junior year at Wellesley, to the serpent pin that sent a message to Sadam Hussein and introduced Secretary Albright’s use of pins as a diplomatic tool, the pins in Albright’s collection span not only her lifetime, but a broad range of personal and political context. While the messages of some pins are intentionally clear—a dove for peace or a crab to relay aggravation with slow negotiations—many have stories that one may not guess upon observation. One such pin is a contemporary silver brooch of the head of Lady Liberty. The brooch was the winning entry in a “Brooching It Diplomatically” contest for its creative use of clocks as eyes. One clock faces up and the other down, so that both Albright and the person with whom she is meeting can see clearly when it is time for the appointment to end. While being aware of the back stories adds depth to the collection, there is particular delight in hearing Madeleine Albright convey them herself. She shares the histories of both the collection and particular selections with wit and candor (and yes, sometimes that signature attitude). Wellesley is pleased to welcome her back to campus for her conversation with President Bottomly. Tickets for the campus event are no longer available, but the talk will be live streamed online, June 16 at 7:00 p.m.